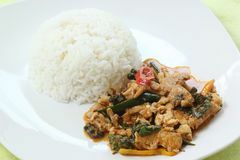 The name panang comes from the island of penang bordering south of Thailand.This homemade panang curry recipe can be made either with chicken or beef and when compared to other Thai curries it is mild in taste. Add all the paste ingredients in a processor and process until a paste is formed. Now heat oil in a wok and add chicken/beef. After stir frying for 5 min add panang curry paste ( home made or brought from the super market). Cook for 5 min with constant stirring. Add coconut milk, when it starts boiling reduce the heat. Simmer for 8-10 min until the chicken is fully cooked. Before turning off the heat add lime juice and fish sauce.